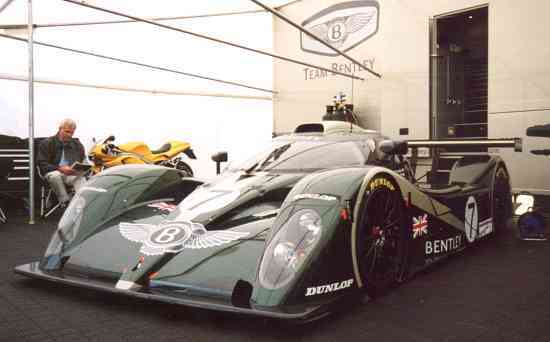 Bentley Motors unveiled but a model of a race-car when in November 2000 the company announced their intention to return to racing at the Le Mans 24-hour race. This was a truly ambitious task because 7 decades had passed since Bentley's last triumph on the Sarthe Circuit. The factory at Crewe was equipped to produce side by side Bentley and Rolls-Royce motor cars - but there was no trace of sufficient equipment to built an all-new competition car. The Crewe premises could add but a few relics to the new challenge: old photos as documents that Bentley indeed some 70 years ago had been a tough and successful competitor with five victories out of eight starts. However for this new attempt after such a tremendously long pause conditions were considerably better than many critics did assume. Well integrated into VW's structure there was the clear advantage of having access to the full knowledge gained within the whole company. There can be no mistake about the most important fact: there really didn't exist a “time-lag” of 70 years dictating to start from zero. VW's subsidiary AUDI had been overwhelmingly successful in competitive events during recent years and their victory at Le Mans in 2000 had been well deserved. - Hence in-house almost all data and experience was available to save time and costs when Bentley started on their new development. It was but a logic consequence to use AUDI's V8-engine as power source on board the new Bentley EXP Speed 8. This was a clever decision to gain as much advantage as possible from existing resources, as the 90º-3,600cc engine with four valves per cylinder and twin turbochargers did guarantee an impressive potential. An Xtrac sequential 6-speed gearbox with Megaline pneumatic system forwarded the engine's power output in excess of 600 bhp to the rear wheels. Equipped with a magnitude of highly sophisticated electronic control units and a brake systems with carbon-fibre discs the power plant was set into a monocoque that combined unique carbon roll hoop assemblies with a carbon-fibre body and chassis. Bentley Motors had decided on a closed body as according to the rules for the Le Mans 24-hour race that did permit increased air-restrictor sizes compared to what was allowed for open race cars. The other side of the coin however was that a slightly reduced tyre size had to be accepted ; under certain circumstances perhaps a sort of disadvantage. After all it needs to be taken into consideration that AUDI worked on two open race cars to be entered at Le Mans in 2001 - and there wouldn't have been much sense in an operation where one marque from VW clashed with another in their ambitions. Countless hours of windchannel- and racetrack-testing had been invested - but in 2001 soon after both cars had started into the 24-hour race a miniscule problem threatened to destroy any high spirited expectations. Torrential rain was pouring down onto the racecourse and after some time both cars suffered the same problem - water found its way into the electronic control unit of the gear-change mechanism. One of the team cars failed to proceed, the second lost considerable time at the box. However its overall performance was such that it finished 3rd after 24 hours. The following year 2002 saw but one car at the start - that made it to the 4th position overall. An extensively re-designed model of the Bentley EXP8 was entered in the "Le Mans 24 Hours", when two cars started. The team of Bentley Boys that had driven car no. 7 added the 6th victory of a Bentley motor car at Le Mans, albeit after some time had passed since the last one. Towards the end of 2000 there had been but a vision exemplified by a toy-like model race car. Due to the combined efforts of designers and drivers that vision had become reality: on the podium of the Le Mans 24-Hour Race in 2003 a team of Bentley Boys celebrating their success. Technical Data: Carbon-fibre monocoque, with rtn stressed carbon-fibre body, Wheelbase 2,730 mm, overall length 4.630 mm, weight 900 kg; 90º-V8 engine, 3,600 cc capacity, 4 valves per cylinder, twin overhead camshafts per cylinder bank, twin turbochargers, dry sump lubrication, Bosch 2.8 engine management, power output 600+ bhp; Xtrac 6-speed gearbox, Megaline pneumatic actuation, AP Racing multi-plate clutch; Suspension with double wishbones all round, torsion bar springs front, coil springs rear, telescopic dampers; ventilated disc brakes all round, AP Racing six piston callipers, top speed 215+ mph.